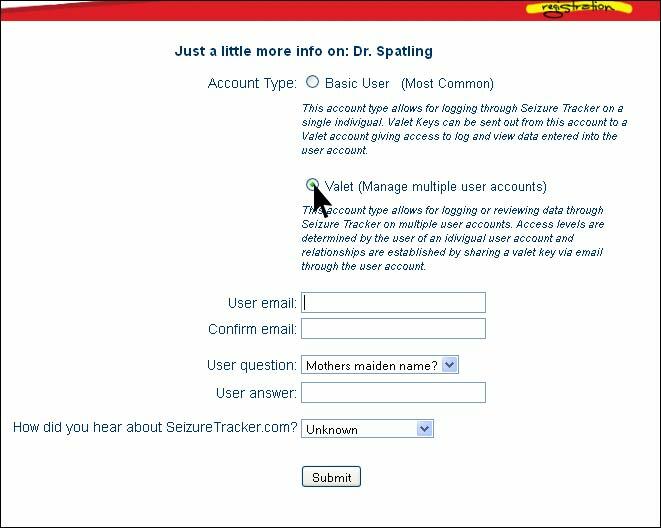 SeizureTracker.com - Valet System - Management Account instructions on accepting valet keys and switching user accounts. 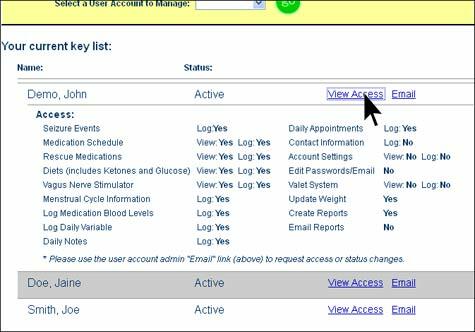 The Valet tool allows Seizure Tracker users to to share access to their account with a Valet management account. Access levels can be customized for each valet relationship. The valet management account allows the user to navigate through multiple Seizure Tracker logging accounts. - Click the create new account link on either the home page or the Valet landing page. - Enter a user name and password. - Select Valet as the account type. - Enter an alternative name and email (if needed). The default will be the user name and email entered as a part of your account set up. *These can also be edited through the account settings page in the management interface. - You will either be directed to the Valet landing page or to the accept valet key page. as a part of account creation. Alternitive name, email and user type. What is the Alternative Email and Name? The alternative Email and Name are what appears in the User account valet key list after the relationship is finalized (or the Valet key invite is accepted by the management account user). The alternative name can indicate to the User account admin who is managing the valet account or the intent of the relationship. The alternative email will be the one that user account admin would use to communicate with the valet account manager. These can be edited at any point by visiting the valet account settings page. A valet key invite is sent via email from the user account requesting the relationship. The invite email will include a web link to a page that will allow the valet management account user to accept the key through a existing in account or create a new account and activate the key. - If you are not already signed into an account already sin in or create a new account if needed. - Review and accept the invite request. You will be directed to the management interface when you accept the invite. You also have the option to ignore the request and go directly to the management interface. - From the main management page key list, click the "View Access" link next to the user name you would like to review. - The list of access options will appear with the current settings. The "View Access" link can be clicked again to hide the access list. Emails can be sent to the user account administrator if there is a need to change the valet key access settings. - Click on the link "Email" link next to the user account name in management key list. - This will activate the email system with the user account administrators email address prepopulated. - Identify the settings to be changed in the email. - From the Management main page, select a name from the pull down menu in the yellow header bar. - Click on the green "go" button. - You will be able to navigate through the user account as the access setting allow. 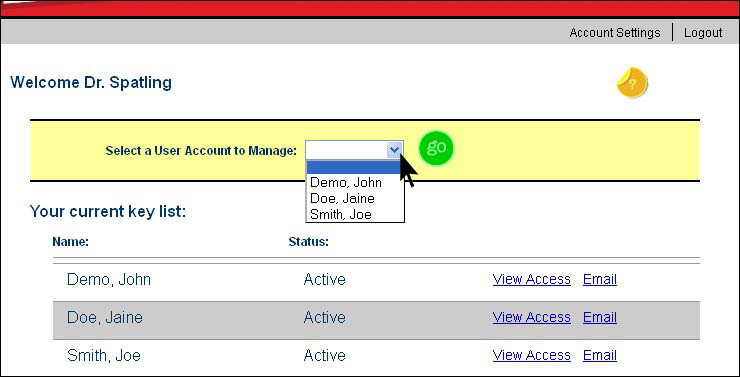 The valet manager bar indicates the current user account selected. - To switch user accounts visit the select a user name from the drop down list and click the "go" button.